HDQ Utility version 0.96 now available! Whew, I’ve been working on this version for quite a while. With the helpful feedback of many people that have tried my software, I’ve made a large number of improvements to the software; of course, there are plenty of features that aren’t implemented yet, but are being worked on. More information about how this utility works can be found here. (Major improvement!) Improved HDQ logging functionality (logs are now saved to a separate file instead of being overwritten). Improved HDQ communication (HDQ breaks no longer require the serial port to be opened more than once, and HDQ no-response timeouts are decreased from 0.5 to 0.3 seconds. Reworded certain error messages for clarity. Renamed file ‘config.txt’ to ‘Config – COM Port.txt’ for clarity. Improved state-of-health warnings by making them non-modal (they do not require the user to dismiss the message). Fixed invalid device name and maximum load current readings for v5.02/sn27545-A4 based batteries (e.g. iPhone 6, 6+…). Added time-to-full readings (for firmware older than v2.24). Improved error-checking for device identification (it will display a notice that the tool may need to be restarted). Updated DingoLib UI library to auto-resize window to 0.9x display resolution for improved readability on larger monitors. Create a dedicated section on my blog for the HDQ Utility. 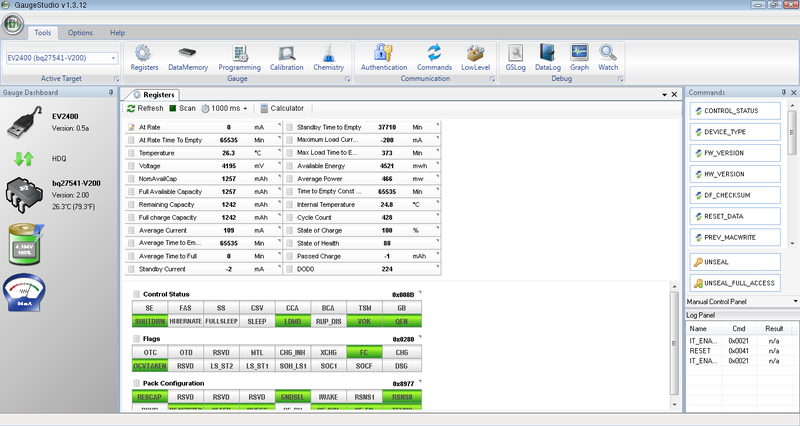 Create a user’s manual describing the parameters displayed by the program (in particular, the Advanced Battery Information section). Improve data logging functionality by saving logs to a subdirectory instead of the program’s root to decrease file clutter. Improve error-checking for commands (retry reads if one or more bytes are not received from the device). Add error statistics indicating how many communication errors occurred during data collection. Improve support for older (older than v1.25) firmware. Improve support for v5.02/sn27545-A4 devices (make use of advanced commands available in this firmware version). Add support for restarting of data collection without having to re-execute the program. Add Data Flash memory functions to allow for readout of advanced configuration, serial number, lifetime/black-box data, etc. Rewrite this program in something that’s not LabWindows/CVI… also, use of a GUI rather than a non-console text UI. The current-sense resistor is on the left of the three gold test pads. The bq27541 in the iPhone battery is on the lower right of this image. … can it be? 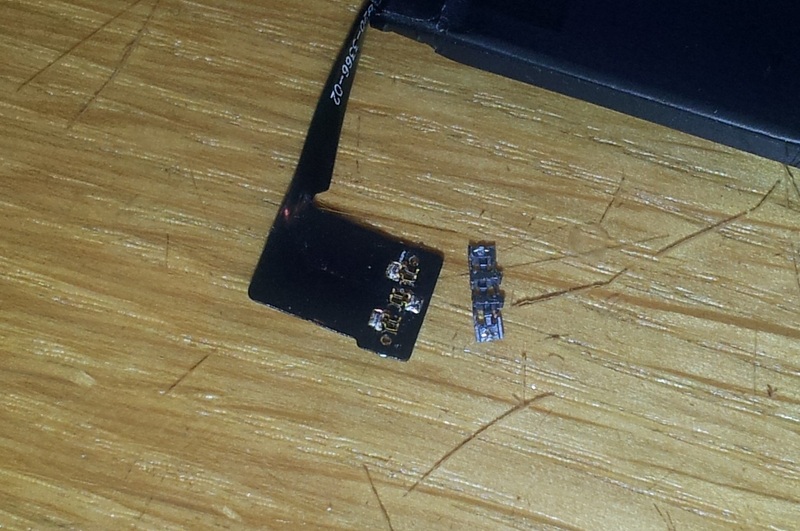 Yes, I found a bq27541 fuel gauge chip inside the battery! After fooling around with the battery, I found out that the battery is using the HDQ interface. The HDQ bus, which stands for ‘High-speed Data Queue’, is a single-wire communications bus used by TI fuel gauges. It’s similar to Maxim’s 1-Wire protocol but runs with different protocols and timing. It operates at 7 kilobits per second (so much for ‘high speed’ right? 😛 ) and a refresh of the data memory in the TI software can take almost half a minute. However, it’s good enough for occasional polling (like every minute or so) since it’s unlikely that the gauge will be read from every second. 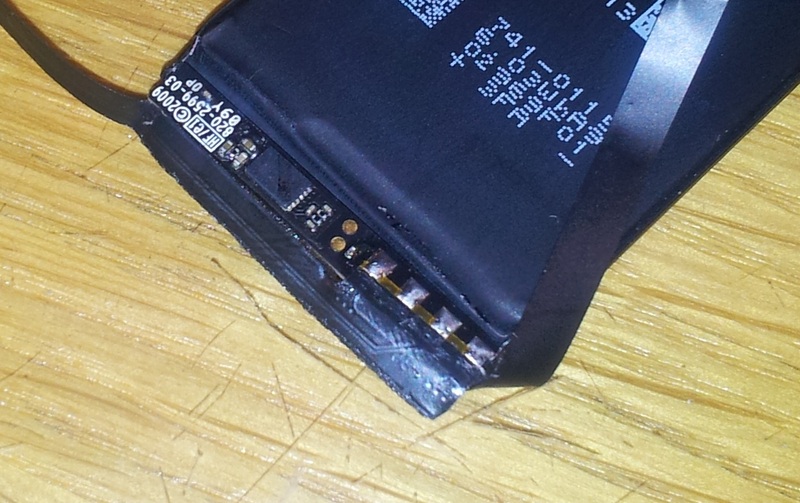 The bq27541(labeled BQ 7541) in the iPhone battery runs an unusual firmware version. It’s running version 1.35 and doesn’t match with any release on TI’s website. The gas gauge is sealed so initially it seems like gaining access to the Data Flash memory would be impossible. However, in non-Apple fashion, the gauge’s passwords are left at the default; 0x36720414 and 0xFFFFFFFF for the unseal and full-access keys, respectively (and it’s not the first time Apple’s done this!). Since the firmware version is unknown, I told bqEVSW to treat the chip as if it were the bq27541-V200. I then saved only the calibration, capacity, resistance and lifetime data. Updating the firmware over HDQ was a nightmare. It took over a dozen tries for each of the two batteries I had, and the update process took 45 minutes (!) 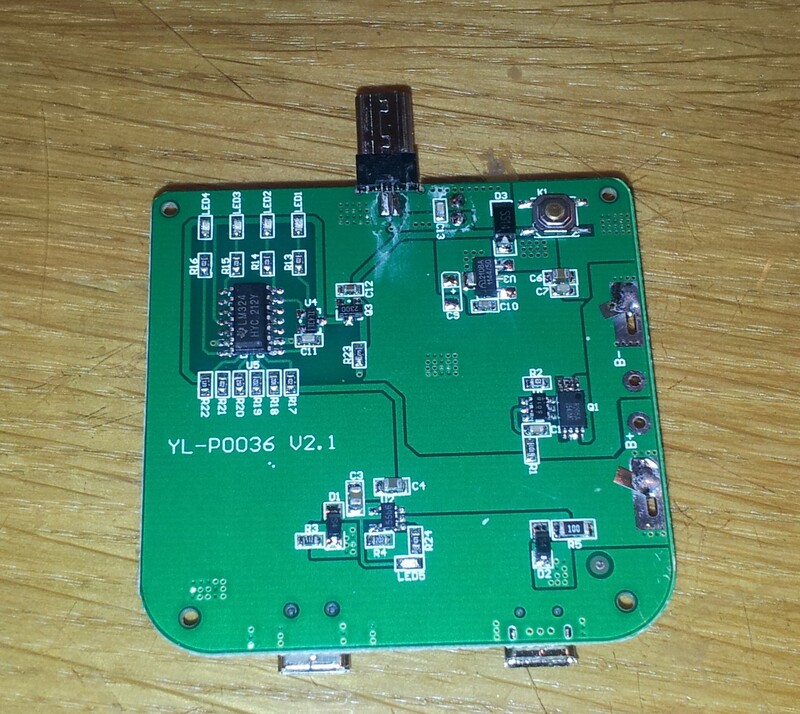 to update the bq27541 to the V200 firmware. At one point, it seemed as if I bricked the chip, but a power-on reset of the chip by shorting the cell very quickly 😀 sent the device into ROM mode (ie. firmware-update mode). From there I used bqCONFIG to update the firmware, and it was successful! Now I could use GaugeStudio to interface with the gauge rather than the unsightly bqEVSW software. Given how long it took for me to update the firmware of the gauge, I have doubts that iPhones will update their batteries’ firmware in-system. Hell, the iPhone OS ignores the bq27541’s State of Charge readings and substitutes its own. Nice going, Apple! I was shopping around at this electronics liquidation store and stumbled upon a couple cheap buys: A “1900 mAh” external phone battery and another 4400 mAh pack (which will be the subject of another post and teardown). The batteries were originally priced at $7 and $38 respectively, but they were on sale at half price. For $3.50, I was curious enough about the 1900 mAh battery’s real capacity that I bought it anyway, expecting to be disappointed. The pack itself is roughly half the size of a typical smartphone and about 1.5 times thicker. The casing itself has no screws; the manufacturer decided it was too expensive to use screws so they simply ultrasonic-welded the case shut. After about half an hour with a plastic spudger tool, I was able to crack the case open. The soldering quality, surprisingly, is pretty good for a sub-$10 device, save for a bunch of hand-soldered components with flux residue left behind. The circuit board is made up of a battery protection circuit (yes, they actually put one in! ), an ME2108A-50 boost converter, something I’d assume to be a charging circuit, and an LM324 op-amp as a “gas gauge” (if you could even call it that!). 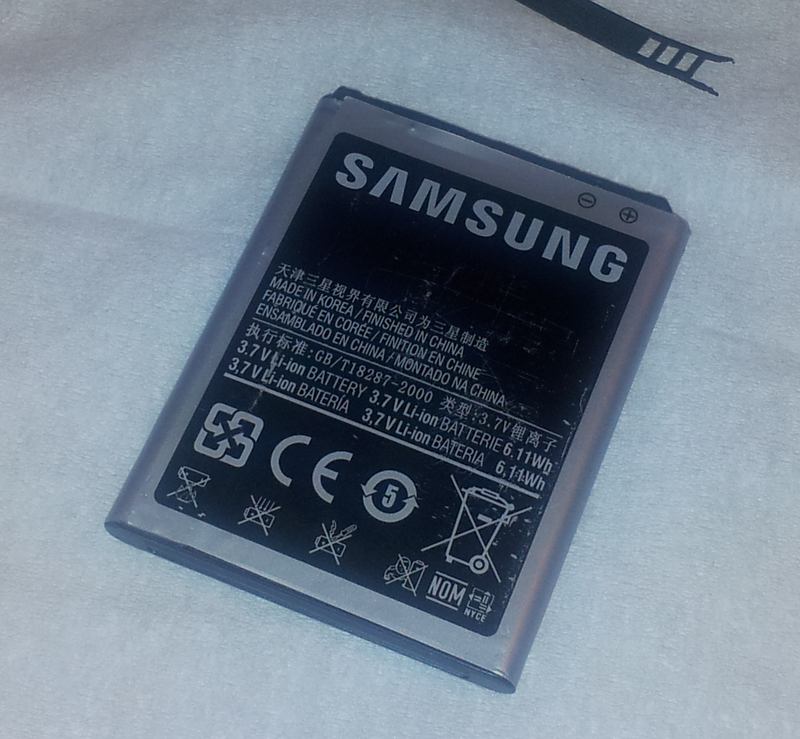 The cell appears to be a thicker version of a typical cell phone battery. It’s similar in size to something like a Nokia BL-5C which is a 1020 mAh cell, and is 5.6 mm thick. The cell in the charger is 7.7 mm thick. The charger’s cell is only 37.5% thicker but should have 190% of the capacity… yeah, no. This is not going to be very promising, given how the spot-welded nickel strips literally fell off the cell when I tried to desolder it from the PCB. After soldering some 20-gauge solid wire to the terminals and hooking it up to a bq27425-G2A fuel gauge chip, I noticed that it reported that the fully-charged voltage is 4.25 volts. This charger tries to squeeze the most out of the cell by overcharging it! Granted, a Li-Ion cell’s maximum terminal voltage is 4.25 volts but it shouldn’t settle down to this voltage after charging! 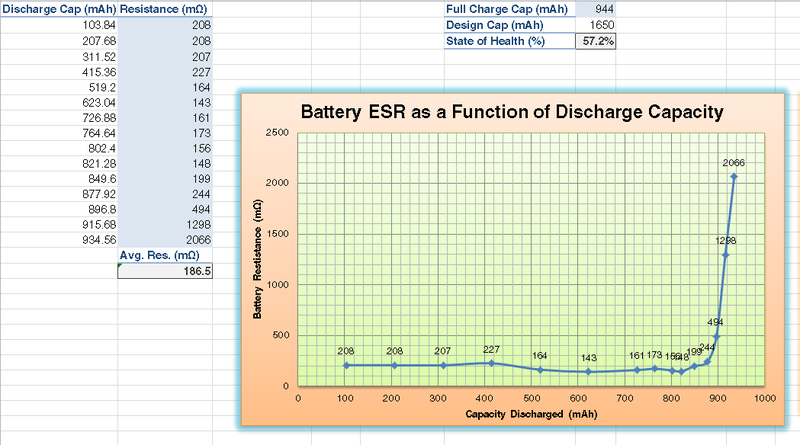 After performing a few learning cycles to determine capacity and resistance, the cell holds merely 1370 mAh. The internal resistance is about 85 milliohms, which tells me that at least they used a relatively fresh cell in this charger and not just some recycled cell (*cough* UltraFire *cough*). When you have the same smartphone for almost 3 years, it’s likely that your original battery’s not going to last as long as the service contract. And as long as you’re not an iPhone user you will probably look into a replacement or spare battery. The outer label states a manufacture date of July 20, 2012. The internal cell states one of September 3, 2012. 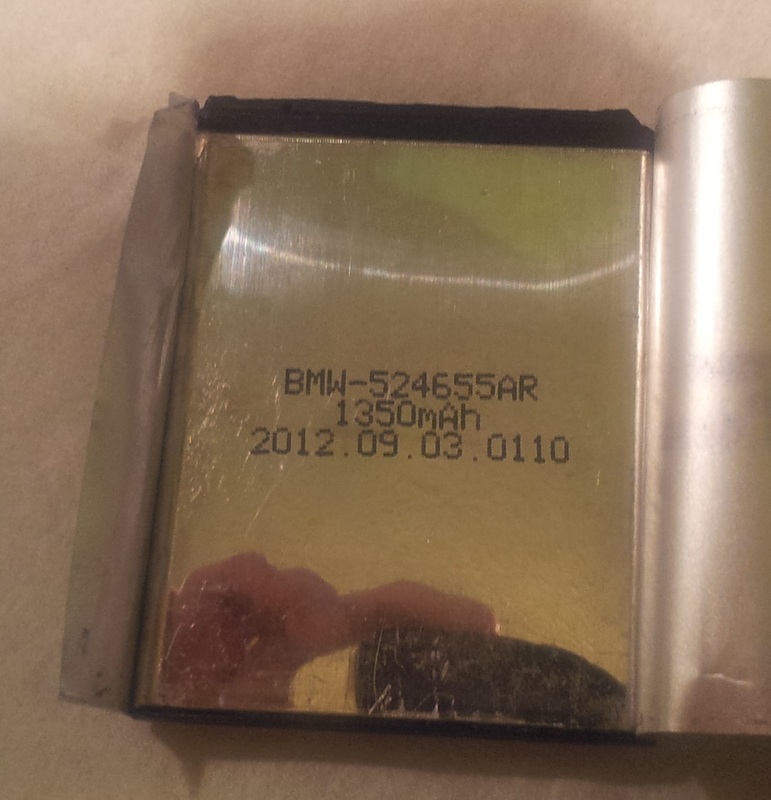 Unless this battery was manufactured in a time-bending factory, then these batteries certainly aren’t genuine. Next up was the protection circuit. 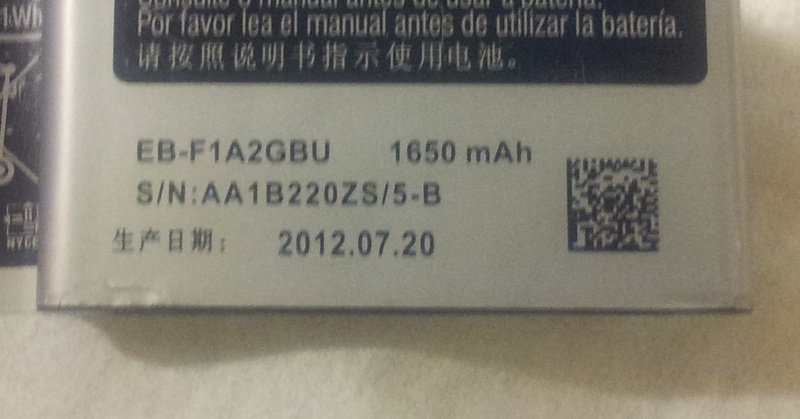 The “genuine fake” battery uses a DW01 protection IC and uses a generic 8205A dual NFET for swiching. And there wasn’t even a thermistor; the PCB uses a 1.5k ohm resistor to simulate one. A genuine board uses a single SMD package that integrates the FETs and the protection IC. (piece of) Genuine protection board. Note how there is only one SMD package. Contact differences. Top = genuine, bottom = fake. The fake has fatter contacts for the two outer contacts. Below is a comparison of the protection board of a fake battery and a “genuine fake” one. At least the “genuine fake” uses the same black appearance of the original. Comparison of the two DW01-based protection circuits. Almost identical. The “genuine fake” battery, after only 2 months of usage (not even 20 charge cycles’ worth), became so swollen that I can’t keep the back cover on. 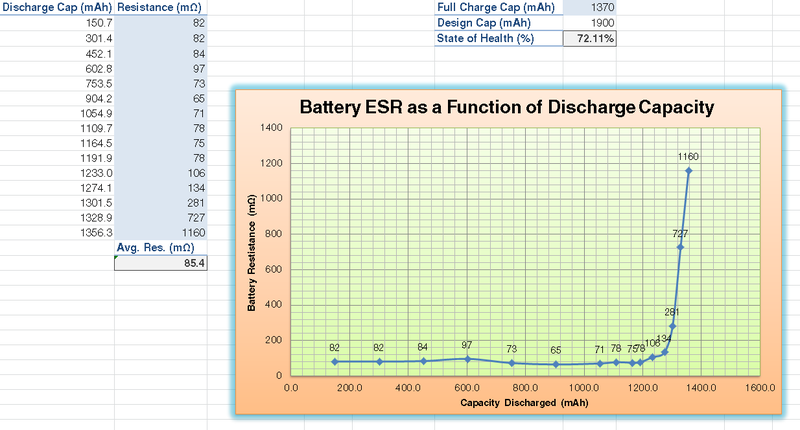 Running this battery through a bq27425-G2A battery gas gauge determined that the real capacity of the battery is a paltry 944 mAh, with an average internal resistance of 187 milliOhms. Absolutely pathetic. Test rig using a bq27425 gas gauge and a 15-ohm power resistor. TI’s Impedance Track algorithm calculates the cell’s capacity and internal resistance. As seen on Hack A Day! I ordered some sample chips from TI a few weeks ago, most of them being lithium-ion battery “fuel gauge” chips. These chips are used in electronic devices to determine exactly how much energy is in the battery, and if the chip’s sophisticated enough, provide a “time until empty” prediction. The bq27421 from TI is packaged in a tiny 9-ball grid array, packaged as a wafer-level chip scale package (WLCSP). This means there is no epoxy covering like normal ICs, making for a compact design that’s a good thing for space-constrained applications like modern cell phones. I’ll talk about this chip later on in this post. The tiny BGA package means that prototyping with these chips is difficult if not impossible, depending on how large the chip is that you’re working with. The bq27421 is about 1.6 mm x 1.6 mm, which is less than 1/3 of the size of a grain of rice. No way you’d be able to put that on a breadboard… right? Well, you can, with a small breakout board, some magnet wire, epoxy (a bigger deal than you might initially think), patience and steady hands. I mounted the chips in what I call a mix between dead-bug (where the contacts face up as if the chip was like a dead bug on the ground) and chip-on-board construction (where the chip is glued directly to a board, wire-bonded and then covered in epoxy). 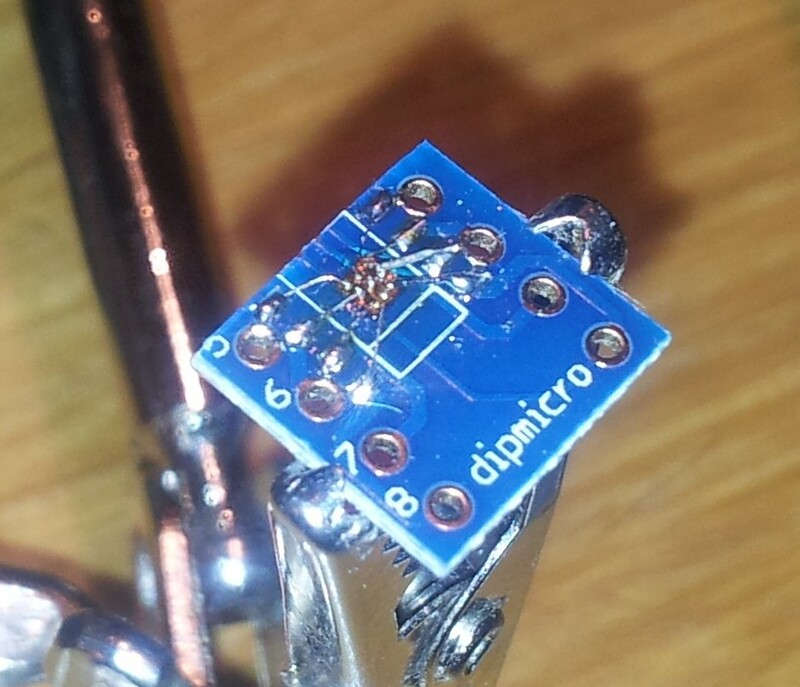 I used some SOIC-to-DIP boards from DipMicro Electronics (link). I often use these boards when doing work on prototyping board since using these surface-mount parts reduce the board’s height compared to using actual DIP packaged chips (which are much less common for modern ICs anyway). 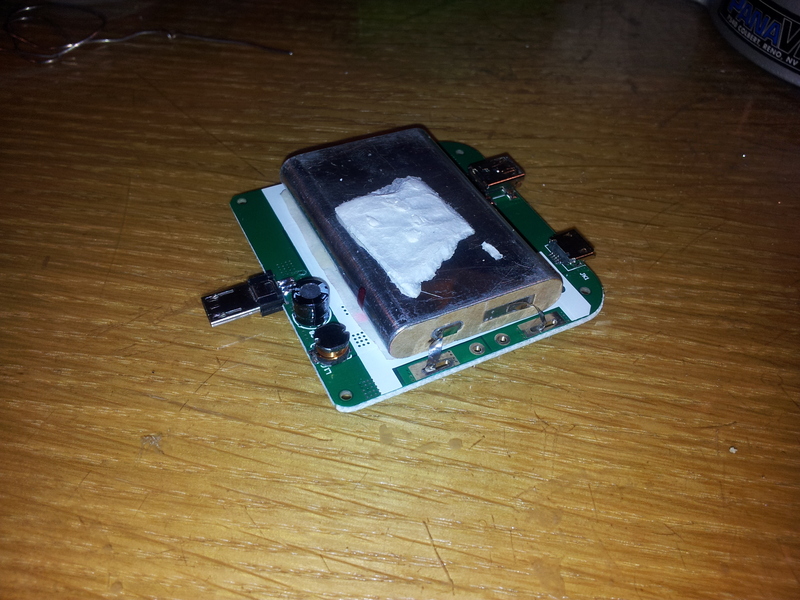 The chip is first affixed to the breakout board using a small amount of epoxy and allowed to cure for several hours. The epoxy, from what I’ve found, is crucial to your success; superglue and other adhesives won’t stand up to the heat of a soldering iron, and if it loosens you can end up ruining your chip and wasting your time spent working on it. After letting the epoxy cure, I then prepare the bond pads around the chip. I place a liberal amount of solder on each pad to allow easy connection with the iron later; I want to minimize the stress on the tiny 40-gauge magnet wire because once the connection is made, the solder ball that the chip came with won’t be as easy to solder to the second time around. Next up is the actual soldering process. I created a pinout for the board in PowerPoint to help plan out how I’ll solder the wires. After tinning a long length of 40-gauge magnet wire, I then solder the wire first to the solder ball on the chip, then solder the other end to the pad I previously put solder on. To minimize the stress on the wire afterwards, I use a small utility knife to cut the end of the wire where the pad is. I then complete this for the rest of the contacts. This took me an hour and a half the first try, but took me about 20 minutes the second time around. Also, for my second try, for the BAT and SRX pins, which carry the full current for any loads connected, I used 30-gauge wire-wrapping wire to allow a bit more current-carrying capacity. It probably is overkill since the maximum current rating for the bq27421 is 2 amps continuous, but I felt a bit more at ease connecting the pins this way. After checking for short and open circuits with a multimeter I then placed headers onto the board and put it into my “evaluation board” that I created just for this chip. Using an EV2400 box from TI, used to connect to their vast range of battery-management chips, I connect the box to my PC and run their GaugeStudio software to verify that the chip works. … and it does, like a charm! I was able to communicate with the chip and also view its operation in real-time. One thing that was causing me trouble before was that after removing the battery and putting another one in, I found that the gauge chip sometimes wouldn’t be recognized by the PC. Being unsure why it was doing this, I dug through the reference manual, and found one tiny part in the manual that showed me why it wasn’t working consistently. 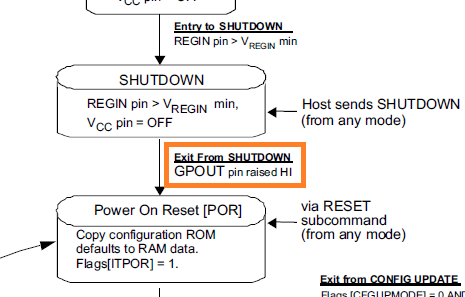 The GPOUT pin was left floating on my board, and the chip requires a logic high signal before it starts up. This brings back memories of my digital electronics class in college; these floating inputs can cause all sorts of trouble if you’re not careful, and in this case, it was mentioned only once in the reference manual. After using a 1 megohm resistor to pull up the pin, the chip worked flawlessly. Now that I verified that the chip was working, I mixed up some more epoxy and covered the chip, making sure that the bond wires and chip were covered to prevent damage. After all that, I had a couple working highly-advanced battery gauges that I could fool around with, and also learned a couple things about deadbugging SMT components and also the basics of chip-on-board construction.